Lizards, which belong to the class Reptilia, resemble the dragons of the old fairy tales and the gigantic dinosaurs of long-ago eras. With their scaly skin, their mostly immovable eyes, and a circulatory system that does not provide the body with warmth, they have long been less familiar to us than mammals or birds. Anyone who wants to keep lizards in a terrarium should know at the start what these animals are like and where they come from. Lizard's body structure, behavior, and living habits provide the lizard-keeper with very important indications for their care and maintenance. Fossil finds provide evidence that the first lizards lived on the earth some 260 million years ago — in the Upper Carboniferous Period. But because even by this time they already existed in many forms, it is clear that there had been a common ancestor earlier. Only the turtles and the Rhynchocephalian tuatara persist into our time. Some 120 million years ago the crocodilians arose. The present-day lizards today number some 3,000 species. They are spread throughout the temperate zones of the earth, thought most species live in the tropical zones. Tree-dwelling, fast-climbing species have long, delicately jointed legs — especially the tibia (shinbone). These lizards have extremely long feet and long toes, which are armed with sharp claws. There may also be fringes of skin on the toes that enable the lizard to run on its two hind legs across a flooded area. Terrestrial lizards have short, powerful extremities and heavy feet. Many of them can dig holes and tunnels in the earth. Water-dwelling lizards have short, powerful limbs and as an adaptation for the aquatic life style they have webs between the toes; these vary in nature from species to species. Many semiaquatic lizards use their flattened tails to help propel them through the water. Special adaptations are the gripping lamellae (platelike growths) on the undersides of the toes of most geckos. On the lamellae are microscopic hooked cells, which enable the geckos to maintain a grip on smooth surfaces such as large leaves, ceilings, and even on glass. Some species of lizards can, in reaction to an extreme stimulus, cast off the tail or a portion of the tail. This behavior, which is called autotomy, is an important defense mechanism. A predator is easily distracted by the cast-off tail, all the more as the tail segment may continue to make slithering movements for a while because it possesses an independent nervous system. Lizards that autotomize have tail vertebrae with pre-established breaking points. The shortened tail regenerates partly or wholly, not by means of new bony tail vertebrae but by developing new cartilage. The appearance of the scales and the color may not always match those of the lost tail. The eyes: Probably the most important sense organs for the lizard are the eyes. In most lizards, the sense of sight is very well developed, even allowing them to perceive colors. Evidence for this comes principally from the many optical signals through which lizards identify each other or communicate. In species active at night or at dusk, the pupils are slit-shaped, to protect the eye from glaring light. As light dims, the slit widens. The ears: Hearing abilities vary greatly from species to species. Unlike the lizards, the crocodilians have an external auditory canal. Some hear well and are even able to distinguish specific noises. For example, geckos have comparatively good hearing; the sounds and cries that they emit during mating, particularly, are an indication of this. The tongue: Aromatic substances are taken onto the tongue tip when the tongue is extended and are deposited into the roof of the mouth where the Jacobson's organ is located. The perception of the aromatic substance is accomplished through the sensory-cell tissue of this organ. Therefore, increased darting of the tongue — at feeding, for example — is analogous to the excited sniffing of a dog. After eating, many lizards polish their mouth with their tongue. Almost all use it to drink or — to put it more accurately — to flick up the water. Geckos that lack movable eyelids regularly polish their eyes with their fleshy tongues. Lizard's tongues differ from species to species. They can be deeply cleft and extended, serpentlike. By means of a notch in the upper jaw, the monitor lizard, for instance, can flick its tongue with its jaws closed. But tongues can also be short and fleshy, as in the iguana. In most lizards the skin is very highly developed. It consists of scales and sometimes bony plates of different sizes and shapes, whose arrangement is always the same within each species but differs within the orders, families, and genera. In the zoological classification of lizards, therefore, the scales serve for recognition and definition. Since the lizard skin is horny on the surface — the surface a lifeless structure that no longer grows — it does not continue to fit during the period when the lizard is still growing. Therefore the skin must be shed from time to time. The lizard molts. The new skin is somewhat larger than the old. The fast-growing young lizard molts at substantially shorter intervals than the more slowly growing older animal, but even mature lizards shed their epidermal skin surface as it becomes worn. Skinks slip out of their skin like snakes and leave it behind all in one piece. Other lizards, like the monitors, lose their skin in patches or shreds. This often continues for so long that an entirely new molting is beginning at the head as the skin on the tail is just sloughing off. Geckos grasp the old skin in their mouth, pull it from the body, and eat it, thereby taking in valuable nutrients. The changing color of the skin is brought about by the expansion and contraction of the pigment in the color cells of the dermis and lower epidermis. The color change is controlled by hormones or by the nervous system. It can be an adaptation to the background or, frequently, it is a reaction to the mood of the lizard. Threats, displaying, courtship, or mating can influence the color range of many lizard species. Dark colors mostly signify rest or submission, but they will also appear when it is important for the lizard to take up as much solar energy as possible. 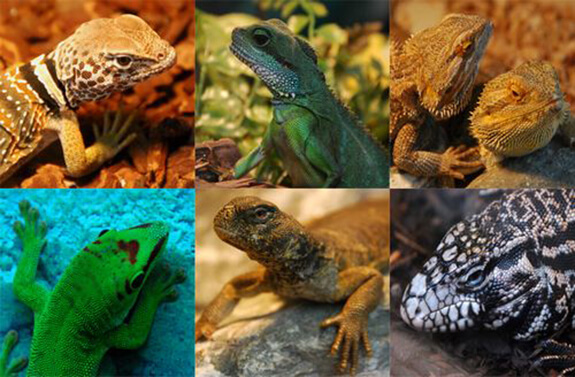 Reptiles, including the lizards, are described as cold-blooded or poikilothermic animals. This means that their body temperature is influenced by the temperature of their surroundings, since — in contrast to mammals and birds — they do not possess (or do so to only a very marginal degree) the power of keeping their body temperature constant. The body temperature can be higher than the environmental temperature when a sunbathing lizard has become dark and is thereby taking up much warmth from the sun. It can be less if a bright color is reflecting the sun. If the heat of the sun becomes too great, lizards seek shadow or damp places in the earth. Since the blood distributes warmth throughout the body, it follows that the heartbeat can exercise a degree of influence over the body temperature. Hints for care: Because lizards cannot accommodate themselves to extreme variations of climate, the lizard-keeper must see to it that the temperature in the terrarium corresponds to the needs of the captive lizard species. Some particularly striking behavior patterns are easy to observe in the terrarium. For example, you can draw conclusions about the mood of the lizard or tell if the animal in the terrarium is under stress. Threatening demeanor varies from species to species. Iguanas threaten a rival by stalking stiff-legged with mouth wide open and trunk vertical and flattened, head nodding, and presenting the dewlap. Bearded lizards threaten with wide-open mouth and prickly black beard — a fold of skin on the neck — erected. The shining yellow mucous membrane of the mouth thus contrasts strikingly with the dark beard. Blue-tongued skinks achieve a similarly terrifying effect with a wide-open mouth, thus exhibiting their shimmering gray-blue tongue and the red mucous membrane of their mouth. “True” lizards (Lacertidae) threaten by high-stepping with head thrown backward. Male anoles nod their heads and erect the dewlap on their necks when they are menacing another lizard. Monitor lizards signal an attack by high-stepping with head sunk and agitated puffing up of trunk and neck. There are also less striking modes of behavior that permit the instant recognition of lizard's moods — for example, the leopard gecko's excited vibration of the tip of its tail that signals an impending attack. It is important for the keeper to recognize the threatening behavior of his lizards. Lizards threaten each other according to a typical ritual — it is a part of their method of communication — but the threat may also be directed toward the keeper. In that case, special caution is indicated. A blow from an iguana's tail or from that of a larger monitor can be painful, as can the bite of a Tokay gecko. Important: If you are bitten by a lizard, see a doctor at once. A lizard that is constantly being threatened by another lizard is placed under constant psychological stress. An animal so threatened will languish if the caretaker does not intervene promptly. A typical submissive behavior pattern is the “treading” of a submissive true lizard. Lying with head and front part of the body raised, it moves the front legs quickly up and down, while the dominant animal threatens with head held upward and legs high. When an animal shows this submissive pattern frequently, the caretaker must intervene to help by providing better territorial boundaries in the terrarium or, if necessary, putting the dominated animal in a separate terrarium.